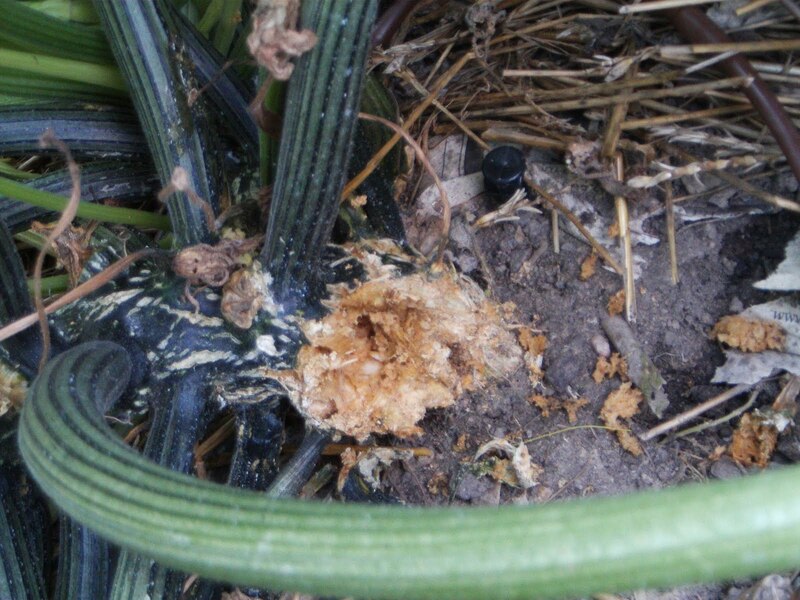 Last year, Bob posted some information about why he was planting his summer squash ‘late’ last year, namely to avoid the dreaded squash vine borer. Well, I’m not that smart (or I just really like to have my zucchini by the 4th of July), and I plant ’em anyway, ready to press my luck. The good news is that a couple of days ago I noticed the frass (the orangy-looking stuff), and took out my trusty garden-knife and got to work. I stuck the knife in, gently, and pulled out one, white, wriggling worm. I (graphic description removed in consideration of our sensitive readers) and all was well. Today, I was again checking my plants, and saw some frass on another vine. I pulled out another two worms and (graphic description again removed). The plants should be able to survive, at least for a while until my second round of zucchini plants gets to fruit-bearing age within the next week or so. Hopefully I’ve avoided further problems with the vine borers, though there’s really no telling whether I got all the worms out. 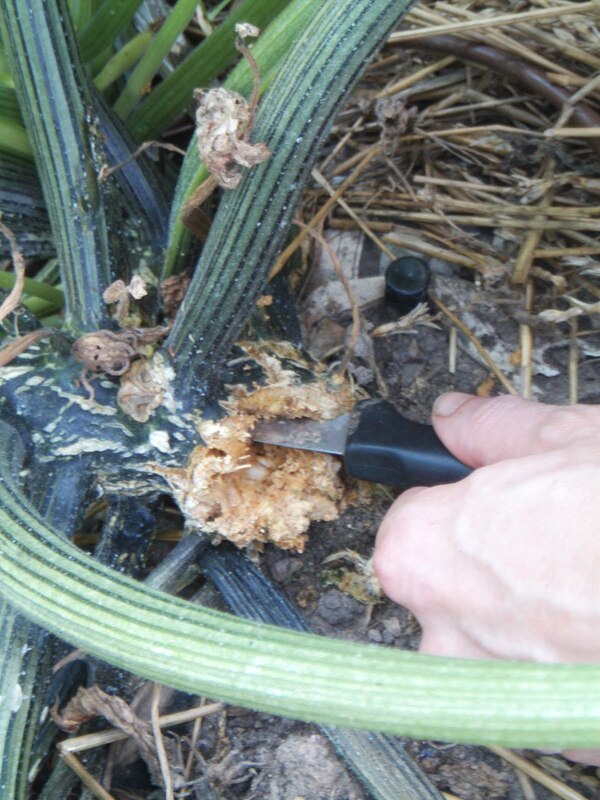 It’s a fine balance between hacking up your plant with the knife and finding worms as you could do just as much damage to the plant as the worm. Anyway, in the past my vines have done okay, even when compromised. I mean, who really needs more zucchini? So, on another front of my Zucchini Wars, I’ve been mechanically disposing squash bug eggs off my squash leaves every couple of days. I really don’t like to spray my veggies with chemicals, but I’m not averse to CRUSHING any insect that gets in my way. 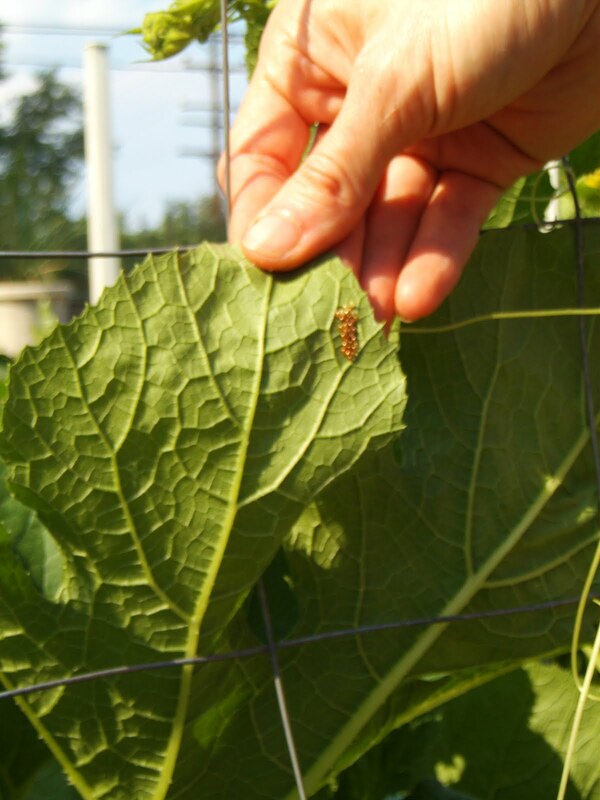 You may recall my Cabbage Worm Armageddon series last year…this year it’s Squash the Squash Bug (eggs)! I used a rock to squash bugs and scrape off eggs from my zucchini plant today. We planted our zucchini late this year. Did not know that helps prevent vine borer infestation. Thanks for the info. Whoops! I didn't mean to imply that scraping off eggs helps with the vine borer problem. These are actually two different zucchini-lovers. The adult vine borer (looks kinda like a wasp) lays its eggs inside the vines. The larvae then eat their way out. The squash bug is a different bug, and looks kinda like a stink bug (but more elongated). It lays the eggs on the leaves, and mostly the nymphs are a nuisance. I just came back inside from squashing eggs, and inspecting my vines. Unfortunately, my borer problem is worse than I thought. I just hope that my young plants waiting in the wings will produce okay in a few weeks. This 100 degree heat sure isn't helping. The moth that lays the eggs that hatch into the vine borer are laid on the surface of the leaf or even the stem. They usually lay a single red egg, the larva then dig into the stem and eat from the inside out. This completely destroys the plants ability to carry water to the leaves. I dug worms out but could not get them all and my plants were literally flat in just one day. I got so mad that I quit planting any hollow stem plants. I have moved across town since then and have grown squash this year with no vine borers. I do have worms eating my zucchini but a dose of BT should take care of that! Just found a white svb worm in the stem of a zucchini I picked yesterday. 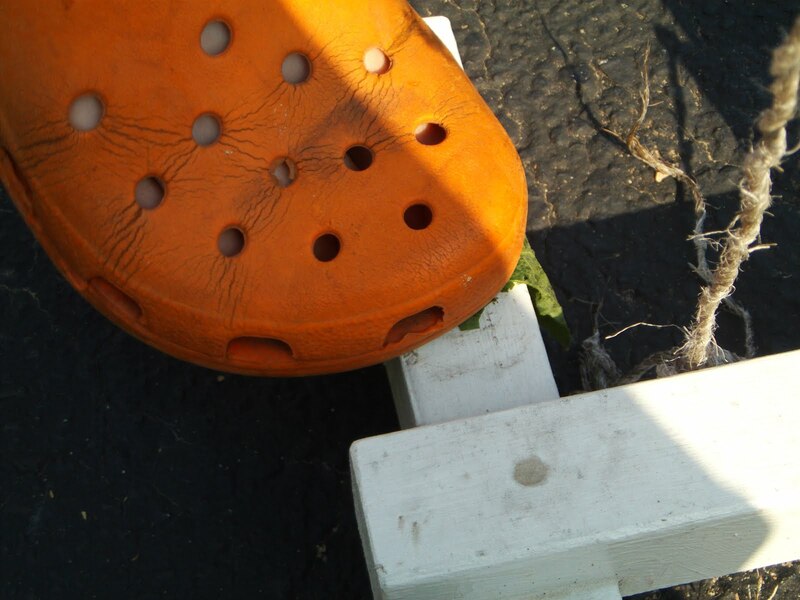 Wondering if that squash is still ok to eat? Do the worms get into the actual squash? Your squash should be fine to eat. It would be very unusual for the borer to get into the fruit.